Ancarrow’s Landing is not the most attractive park in the JRPS. It is a functional boat landing in the tidal waters of the James, popular with fisherman and motor boaters. The acreage is largely dedicated to parking. The small series of trails in the park are mostly made my fishermen looking for the right spot to cast their lines. The park has a large ramp for motor boats, the only access in the James River Park System for them. There’s also access here to the historic Richmond Slave Trail and the notorious Manchester Docks. Ancarrow’s is a popular fishing area, especially in the spring. There is a wooded trail that connects the park to Floodwall Walk, which is part of the Richmond Slave Trail. Great Shiplock Park, Chapel Island and the Intermediate Terminal are in view across the river. 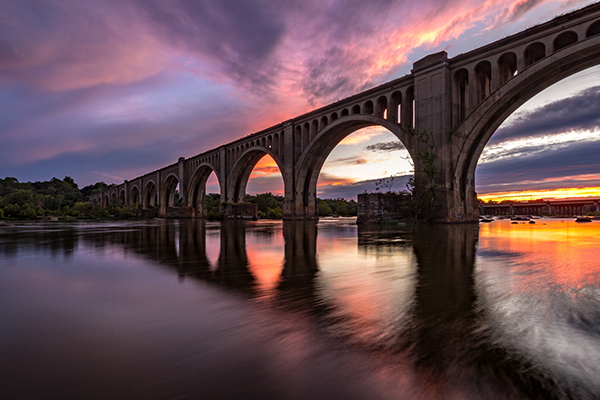 The park is named for Newton Ancarrow, a scientist turned master boat builder who became a pioneer James River conservationist and environmentalist. He died in 1991. The “nature preserve” feel park goers appreciate in the western portions system is harder to detect at Ancarrow’s Landing. The views of the flat river here are more industrial, but there are some decent views of the Richmond skyline and Libby Hill. I’ve always thought of Ancarrow’s Landing as the ugly duckling of the James River Park System. Envisioning the JRPS as a football team, Ancarrow’s Landing would be the kicker — everybody hates the kicker, but you’ve got to have one. Ancarrow’s Landing is the only true boat launch in the system, and is a necessary cog in the park’s repertoire. The parking lot and boat landing can be a very busy place on a beautiful spring day during the peak of fish migration in Richmond – the place where the Falls of James River meets the tidal waters. In peak spring hours, the lot can be packed, with boat trailers in line for at least a 20-minute wait to drop their boat in the slip and overflow vehicles lining Brander Street and the areas under the Interstate 95 Bridge. The parking lot at Ancarrow’s can accommodate approximately 100 cars and trailers, but it is the only landing in the city, and the parking area holds less vehicles when almost all of them are pulling a trailer.